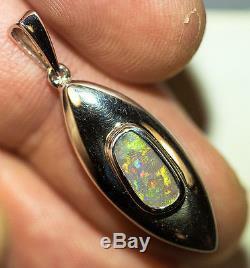 Solid Semi-Black Opal Sterling Silver (925) Pendant. 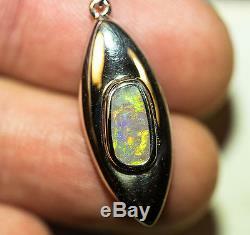 Solid Semi-Black Opal Sterling Silver Pendant (MICK'S) - YouTube. Video will open in a new window. This pendant is much more beautiful than on the pictures! Gorgeous solid semi-black opal Lightning Ridge opal! Set into a beautiful hand-made sterling silver pendant. 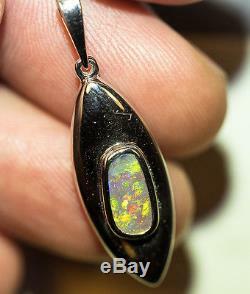 The opal is a 2.30ct solid semi black opal, very bright, 4 out of 5 in brightness. Looks great under any light! The pendant is hand made from sterling silver (925) (it's Rhodium plated, so it won't tarnish)! The pendant weighs 2.80 gram. This hand-made opal pendant is absolutely gorgeous. I only sell solid(natural) black and crystal opals from Lightning Ridge. The size of the stone. Of the stone is 2.5. 2.80 gram Sterling Silver (925) Rhodium Plated. Measurements: 33 x 11 mm. Note: 1 Inch equals 25.4 Millimeters. 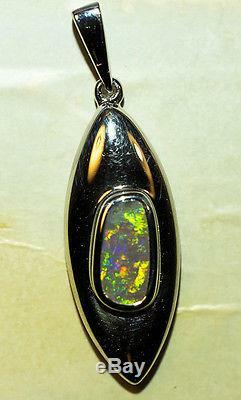 Don't miss out on this truly beautiful solid semi-black opal pendant! The item "Natural Solid Australian Rare Semi-Black Opal 925 Sterling Silver Pendant" is in sale since Tuesday, November 16, 2010. This item is in the category "Jewelry & Watches\Fine Jewelry\Fine Necklaces & Pendants\Gemstone". The seller is "mik989" and is located in Lane Cove, New South Wales. This item can be shipped worldwide.